Special thanks to Region 17 for celebrating with Naturally QT at Harmony Weekend, Sawmill Creek. This photo is our version of "Dale Syverson's" creating resonance class... Isn't she the best! Naturally QT is looking forward to seeing everyone at the upcoming Region 17 Harmony Weekend with Dale Syverson, February 6-7, 2015. We encourage all quartets to come to the Encore Club Quartet mixer on Friday night for a "Tag-it-Out" with Naturally night. We had such a fantastic time performing in Baltimore and want to thank all of you for your love and support. Your encouragement means so much to all of us! We can't wait to sing in Baltimore! 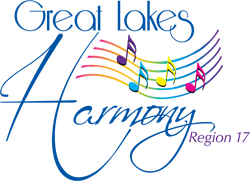 We've had the opportunity to sing for Shoreline Sound and Spirit of Detroit choruses in Region 2 and now we're on to the Greater Cleveland Cabaret on Saturday, October 25th. We have the best support from Great Lakes Harmony, Region 17 and our sisters from Region 2 and Region 4~ We're Proud to represent all of you in Baltimore! Love, Kathy, Amy, Beth, Maria~ "Naturally"
Our 2014 Regional Champion chorus will be representing both Region 17 and Region 3 this year in Baltimore for the Sweet Adelines Harmony Classic Invitational. Only five mid-size choruses in the entire organization are invited to attend. They will be performing on Tuesday night, November 4, 2014. Details on performance times and about the webcast will be posted on the Sweet Adelines International website. Watch for contestant #33 in Baltimore on Wednesday, November 5, 2014! Naturally Quartet will be representing our region in the quartet semifinals this year at the Baltimore Convention Center. The full schedule and details about the webcast will be found at Sweet Adelines International website.